5 REASONS YOU SHOULD OFFER HSA’S TO YOUR EMPLOYEES – Flexible Benefits Inc.
There’s no question that mountains of uncertainty currently surround our healthcare system, the benefits and its future. No one knows what will be around a year from now or even a couple of months from now. Terms change daily and each trip to the doctor brings up another unknown roadblock. If you’re a business owner, help take away that uncertainty for your staff. You can do that with HSA’s (Health Savings Account). 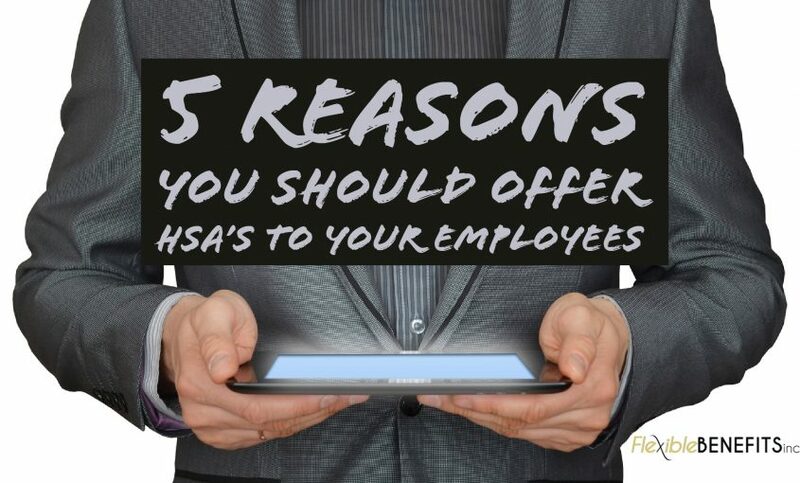 Here are five reasons you should offer HSA’s to your employees. HSA’s are a tax-advantaged savings accounts available for those with a high-deductible insurance plan. They are not subject to federal taxes at the time of deposit. In addition, the interest earned on the savings in the account over time is not subject to taxes. Moreover, there are no tax hits applied when withdrawing money for approved medical costs. Unlike a FSA—Flexible Spending Account—which has a time and monetary calendar limit, an HSA allows for rollover funds. Whatever is put into your account and not used will still be available the next year. Essentially, it’s a legal tax shelter, like a Roth IRA, but for medical and health expenses. That makes it a great way to save for future medical costs without penalty. It’s also a perk to those wanting to stow away some cash for health and comfort in the future. It’s hard to save for retirement penny by penny. And many savings accounts are subject to taxes or garnishment during medical emergencies. An HSA will allow you to put away money from every paycheck, gain interest over the years, and then be there for retirement age. This isn’t to suggest you stop putting money in a retirement fund; but the chances of retiring with no medical problems in your future is low. The HSA allows for funds to be put aside specifically for those medical issues that can arise. Once the owner of the HSA passes away, the plan can be passed on to a beneficiary. If the person is a spouse, then the funds remain tax free, taking a load off the mind of the one receiving the plan. If the person is not a spouse, then they must pay the applicable tax determined by the fair market value of the HSA for one year. As a product of consumer-driven health care, HSA’s encourage users to save for future medical costs and promote preventive health care. When the consumer is directly responsible for their health care costs, they are much more vigilant in the choices they make in healthcare. They’re more careful about going to the hospital for small things and they take extra care to prevent any sickness that could spiral out of control and incur larger expenditures. All these things are encouraged by an HSA since they are directly owned and managed by the consumer. There is a multitude of options for healthcare available in the marketplace. Trying to find the best one can be overwhelming and then using it can cause even more of a headache. Help your staff take the worry out of healthcare. Keep in mind these five reasons you should offer HSA’s to your employees from Flexible Benefits Inc. when shaping your benefits package. Contact us at (251) 237-1115 or toll-free at 1-888-821-9007.